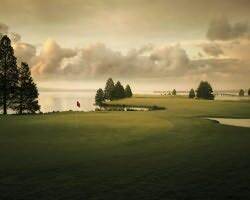 Woodlake Country Club – Palmer Course | GolfTrip.com - Golf Tips, Vacations, Packages, Destinations and more! Located 20 minutes away from the historic village of Pinehurst, the Woodlake Country Club – Palmer Course offer 18 holes of challenging round featuring 6,882 yards of golf. This par 72 course has 72.9 rating and slope rating of 133 on Bermuda grass allowing players of different levels to enjoy their game. This golf vacation destination is designed by Arnold Palmer and harbors a fully functioning clubhouse. The clubhouse serves sumptuous meals for breakfast, lunch, and dinner to aid the golfers’ hungry stomachs. For visitors who are looking for the ultimate golf experience, this resort owns the setting to be worthy of every guest’s time and money. The Woodlake Country Club – Palmer Course has a 25-meter pool overlooking the glorious lake in which members enjoy fishing, swimming, water skiing, and boating. The historical Oates House which is built in 1792 complements the resort’s traditional theme of casual and fine dining. Golf trips spent on this resort are worth remembering and there’s no other resorts which can provide this kind of experience. During Sundays, the clubhouse serves buffet brunch starting at 11:00 am to 3:00 pm. Furthermore, dinner is served during Tuesday, Thursday, Friday, and Saturday evenings. Membership fees and annual dues are being posted on the resort’s website. The Woodlake Country Club – Palmer Course has different types of membership including premier gold, premier golf plus, premier single, and premier single plus. These golf vacation package deals also include premier silver and premier silver plus types of memberships. Membership categories should be chosen before January of the upcoming year.